Zinc is a mineral that is important for your immune system. 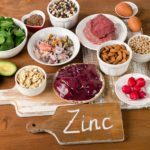 Zinc is also needed for wound healing and normal growth and development. Because your body cannot make zinc, you must get it through your diet. The amount of zinc you need daily, or the recommended dietary allowance (RDA), depends on your age and gender. Girls age 9 to 13 years old need 8 milligrams of zinc each day. Girls age 14 to 18 years old need 9 milligrams each day. The tables below list some foods that are rich in zinc.